On a spectacular intergalactic mission merging dry sarcasm with outrageous, Monty Python-esque humor, The Hitchhiker’s Guide to the Galaxy combines the witty, the absurd, the imaginative, the highly improbably, the really very improbable, interstellar administration, whales, two-headed (and thus two-faced) galactic presidents, shaky futuristic science, and depressed robots. What’s not to love? It all begins the way most disasters do – with some red tape. Earth man Arthur Dent, unwitting friend to an alien pretending to be a failed actor, is trying to stop some men from knocking down his house for a freeway, when a team of spaceships arrive to destroy earth (ironically, for an interstellar freeway – really, the plans were on Alpha Centauri for fifty years, people.) Hitched off the planet by his alien friend (Ford Prefect) who just so happens to be a journalist for the Hitchhiker’s Guide to the Galaxy, Arthur is introduced to the stellar guide and its soothing cover message – Don’t Panic. Good advice considering that, you know, Arthur’s world really is over. But the adventure has only begun! 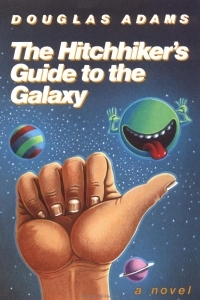 Morphing from eccentric to downright bizarre, the tale travels at warp speed across the galaxy as Ford and Arthur try to escape the Vogons (an odious administrative race of aliens with a penchant for bad poetry). Along for the ride is Zaphod Beeblebrox (spaceship thief and president of the galaxy,) his calm girlfriend Trillion, and Marvin the clinically depressed robot. 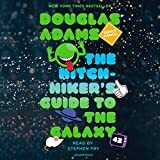 A cultural icon with references spanning television, video games, novels, and just common-speech, Hitchhiker’s Guide to the Galaxy is one of those marvelous creations which most of us have heard of, many of us can (and do) quote in regards to 42, and few of us have actually read. Back on my kick to read the classics, I decided after a particularly dry war tome, it was time to jump to something a little feistier in nature and frankly, more fun. I was more than rewarded. So, here’s why thirty years later, you should still be reading this quirky, sardonic, wacky novel and if you haven’t already read it, here’s why you need to just stop everything and read it now. The daily routine of responsibility, trudging to work, and occasionally falling asleep and rear-ending the barely moving car in front of you doesn’t leave much time for happiness in life, and certainly not much time for exuberance. That’s one of the many reasons this book is still relevant. It’s irreverent and facetious, poking fun at the system and all the administration and boxes we have to check to get from Point A to Point B to appease the authorities that be and our so-called rules of existing in the rat race. As a matter of fact, it pretty much wins the reader over from the first sentence when it starts mocking society and everything we hold sacred. Yes! Yes! Tell it Douglas Adams! Preach to the choir my man! Where else can you get that kind of verve, that plucky humor that is just plain craziness? Didn’t I tell you that the novel was like being in a Monty Python skit? Now do you see the genius! And this is only an excerpt from the beginning before things really get, as they say, cooking. With a sharp honed wit with like that, what’s not to love about our characters who unwittingly provide commentary as they dash about the galaxy in search of success, digital watches, a Pan Galatic Gargle Blaster, or, you know, an ancient super-secret legend involving some mice and a really old planet. Personally, the smarmy Zaphod is my favorite. A self-serving politician with an ego-complex and a destiny for disaster – all too true and yet, all too humorously lovable in this oddly happy but very messed-up world. The other characters are, of course, just so intriguing and downright captivating you want to grab your towel and jump on a spaceship with them . . . except, well, Marvin. Who needs an angst-ridden personality prototype robot around?